The tables below show S&P 500 and NASDAQ performance following point A and point B, telling us to keep an open mind about better than expected outcomes in the stock market over the next two years. 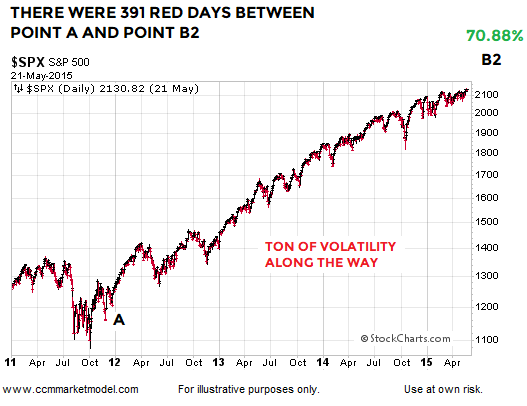 The first 30-90 days reflect normal market volatility, meaning even if good things happen over the next two years, we should expect pullbacks, red days, red weeks, and red months. Point A in the XLF:SPY graph is November 30, 2011. The S&P 500 gained over 70% between point A and point B2 (graph below). To capture that gain, an investor had to endure 391 red trading sessions with an average decline of 0.56%. There were 481 green trading days with an average gain of 0.57%. Therefore, we learn very little about the market’s long-term health by reviewing a red day or cluster of red days in isolation. Red days are normal and to be expected.